May the countdown to Thanksgiving begin. These Pecan Pie Bars from Joy the Baker's new cookbook are the perfect pre-thanksgiving indulgence. I'm now the proud owner of Joy's second cookbook, Homemade Decadence, thanks to Blogging for Books. I've been a long time fan of Joy's blog and already own her first cookbook. When it was time to pick out my next book from the B4B archives, Joy's was a no brainer. This book blows her first cookbook out of the water. It's double the content and I can confidently say I want to make everything in it. It was a struggle having to decide what I would bake first, but because of the holiday season, Pecan Pie Bars had my tastebuds tingling. The shortbread crust, chocolate chips and addition of liquor helped too. Sunday looked like this, so it was a no-brainer that it had to be a baking day. After making the crust and getting it in the oven I started making the pecan mixture. Melted butter, brown sugar, corn syrupy goodness was all combined when it was time to add the eggs and BAM! A double yolk! I let out a slight squeal, quickly snap chatted it (I'm such a stereotype of my generation), and now I'm waiting to see what kind of luck it brings me. 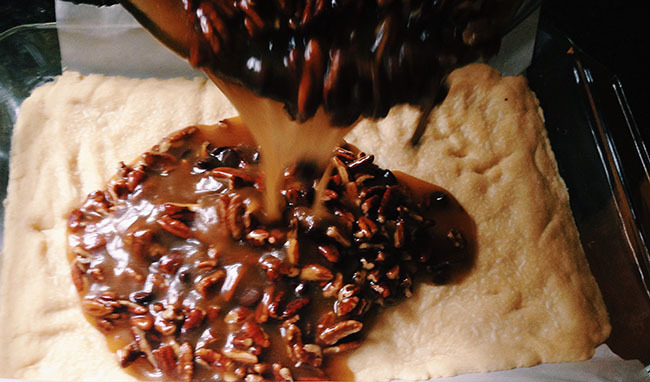 Joy may call them Pecan Pie bars, but these guys will now forever be "Lucky Bars." Preheat your oven to 350 degrees. Grease a 9 x 13 inch baking pan, then also line it with parchment paper. Grease it again to ensure the pecan bars will come out easily! For the crust:: combine flour, powdered sugar, butter and salt in an electric mixer with the paddle attachment. Beat until completely combined, about 4 minutes. Dump the mixture into the prepared pan and use your fingers to spread the crust out evenly. Bake for 12 to 15 minutes or until lightly browned. Keep the oven on. For the filling:: whisk together the melted butter, brown sugar, corn syrup, eggs, liquor and salt in a medium bowl. Stir in the pecans and chocolate. Pour the mixture over the crust and spread evenly. Bake until set, about 25 to 30 minutes. You're supposed to let them cool completely before cutting into bars, but when you have the scent of pecan pie filling your house it's a little hard to wait. The bars will stay fresh in an airtight container for up to 4 days. I have a weak spot for shortbread. The crust is so buttery and when paired with the sweet chocolate pecan topping, their just, just, just, so good. They are like pecan pie turned up a notch. Joy's cookbook is now a top favorite for me. On my bake list are her Lemon Bars, Classic Vanilla Cake, Roasted Balsamic Strawberry Grits, Dirty Chais and Breakfast Biscuit Cobbler. Read my full review of Homemade Decadence on Blogging for Books. BRB while I go cut tiny piece after tiny piece until I realize I just ate about two full sized squares... Once a grazer always a grazer. I received this book from the Blogging for Books program in exchange for this review. If you are a also a blogger make sure to check out their site on how you too can start Blogging for Books!